Python Script for MySensors WiFi/Ethernet Gateway: To communicate with MySensors WiFi/Ethernet gateway I’m using Python script which run as cron job on my controller (Raspberry pi). Python script is used to receive all incoming and sending all out going commands through serial gateway to all MySensors nodes. You can start python script to check all communication is working fine and script can communicate with MySensors WiFi/Ethernet Gateway. 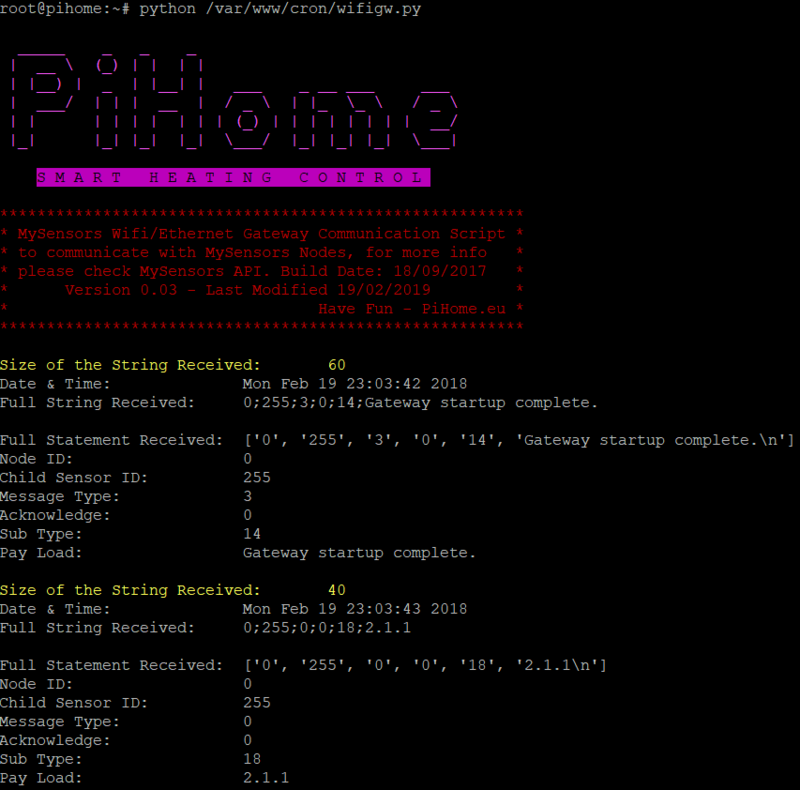 Login to your raspberry pi via ssh and issue following commands one by one to install Python, PySerial, MSQL-Python for interfacing with serial port and save data to MySQL database. Once all the dependencies are installed you can modify python script as per your MySQL/MariaDB login credentials and your WiFi/Ethernet gateway ip address and run following from ssh. First you need to create table in MySQL database so we can save all incoming messages from wireless sensors to MySQL database. Simply create table or copy and past this script to create table. Python script runs in loop to capture all in incoming messages and check database base for any outgoing messages. print bc.hed + " "
print " _____ _ _ _ "
print " | __ \ (_) | | | | "
print " | |__) | _ | |__| | ___ _ __ ___ ___ "
print " | ___/ | | | __ | / _ \ | |_ \_ \ / _ \ "
print " | | | | | | | | | (_) | | | | | | | | __/"
print " |_| |_| |_| |_| \___/ |_| |_| |_| \___|"
print "* MySensors Wifi/Ethernet Gateway Communication Script *"
print "* to communicate with MySensors Nodes, for more info *"
print "* please check MySensors API. Build Date: 18/09/2017 *"
print "* Version 0.04 - Last Modified 11/05/2018 *"
print "* Have Fun - PiHome.eu *"
count = cur.fetchone() # Grab all messages from database for Outgoing. if count > 0: #If greater then 0 then we have something to send out. print bc.grn + "Total Messages to Sent : ",count, bc.ENDC # Print how many Messages we have to send out. msg = cur.fetchone(); #Grab first record and build a message: if you change table fields order you need to change following lines as well. out_child_id = msg #Child ID of the node where sensor/relay is attached. out_payload = msg #Payload to send out. print "Message From Database: ",out_id, out_node_id, out_child_id, out_sub_type, out_ack, out_type, out_payload, sent #Print what will be sent including record id and sent status. msg += str(out_child_id) #Child ID of the Node. # ..:: Un-comments Following two lines to see what you are receing and size of string ::..
# print "Size of String: ", sys.getsizeof(in_str)," \n"
# print "String as Received: ",in_str," \n"
# First time MySensors Node Comes online: Add Node to The Nodes Table. print "1: Adding Node ID:",node_id, "MySensors Version:", payload, "\n\n"
print "1: Node ID:",node_id," Already Exist In Node Table \n\n"
# Add Nodes Name i.e. Relay, Temperature Sensor etc. to Nodes Table. payload = payload[:-1] # remove \n from payload otherwise you will endup two lines sensors name in database. 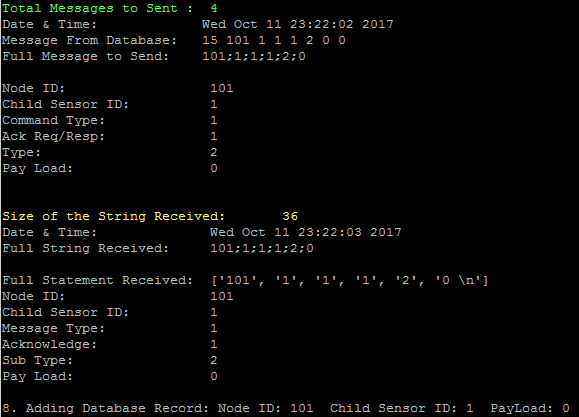 print "2: Update Node Record for Node ID:", node_id, " Sensor Type:", payload, "\n\n"
# Add Nodes Sketch Version to Nodes Table. print "3: Update Node ID: ", node_id, " Node Sketch Version: ", payload, "\n\n"
print "4: Adding Node's Child ID for Node ID:", node_id, " Child Sensor ID:", child_sensor_id, "\n\n"
print "5: Adding Temperature Reading From Node ID:", node_id, " Child Sensor ID:", child_sensor_id, " PayLoad:", payload, "\n\n"
print "6: Battery Voltage for Node ID:", node_id, " Battery Voltage:", payload, "\n\n"
print "7: Adding Battery Level & Voltage for Node ID:", node_id, "Battery Voltage:",b_volt,"Battery Level:",payload,"\n\n"
# Add Boost Status Level to Database/Relay Last seen gets added here as well when ACK is set to 1 in messages_out table. print "8. Adding Database Record: Node ID:",node_id," Child Sensor ID:", child_sensor_id, " PayLoad:", payload, "\n"
xboost = "UPDATE boost SET status=%s WHERE boost_button_id=%s AND boost_button_child_id = %s"
print "9. Adding Database Record: Node ID:", node_id, " Child Sensor ID:", child_sensor_id, " PayLoad:", payload, "\n"
xaway = "UPDATE away SET status=%s WHERE away_button_id=%s AND away_button_child_id = %s"